Our world is full of polished glass walls, shiny screens and smooth surfaces – perfection has become the bare minimum. Add some tasteful accents to your surrounding with handmade acrylic paintings in Shabby Chic style and do not hesitate to be individual. Romantic motifs and soft pastel colours are combined to create artworks with a distinctive character. Our artists create classy paintings in different shades of grey, with which you can show that you are open to something different and have a stylish taste. The oxymoron ‘Shabby Chic’ opens up a space of contradictions and tension, while suggesting how the opposite styles can complement each other in harmony. Owing to our unique painting techniques, paintings from KunstLoft may appear imperfect – but it is precisely this impression that gives them a special charm and touch of life. Whether it is a heart made of gold foil or dancing flamingos in baby pink, handmade Shabby Chic acrylic paintings always tell a different story to every viewer and stand out through the combination of different materials, simple patterns and washed-out colours in natural tones. This form of patchwork art is captivating, lively and stylish – don’t miss out on this chance to make an artistic statement in your office or hotel. 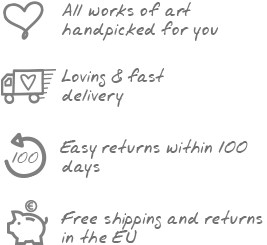 To choose one of KunstLoft’s original pieces means to call a highly valuable and eye-catching artwork your own. Your outstanding taste shall be reflected from your walls. However, it is not only with acrylic and oil paintings that you can bring out your exceptional sense for art. Our handcrafted sculptures are equally create a sensation – and in three dimensions! Feel free to browse through our many categories and you will surely find what you have been wishing for. Artworks in shabby chic style lend your office or living room a unique charm. A combination of curiosities, old and new restrained elegance and warm colours, having seemingly escaped the passage of time. Impress with this delicate style in combination with noble accents.